Anyway, I hope there will be more analysis of the text in the Voynich manuscript and that the results will be compared with the most plausible creation theories. There is certainly still a lot to do. Further reading: Who can solve this Freemasonic rebus book? Bin schon gespannt auf Teil 4 & 5. Knowledge is usually documented so that mankind — everyone — may benefit from it. So, the persisting question is: Why would anyone go through all the trouble of encrypting that book? If it’s nonsensical, why would someone go through the trouble of making an entire detailed book of nonsense? To sell it to a rich book collector. I don’t know if this plan was successful in the 15th century, but in the 20th century the VM is worth millions although (or because) nobody can read it. up to now I didn’t know that you are so much in favour of the nonsense hypothesis. 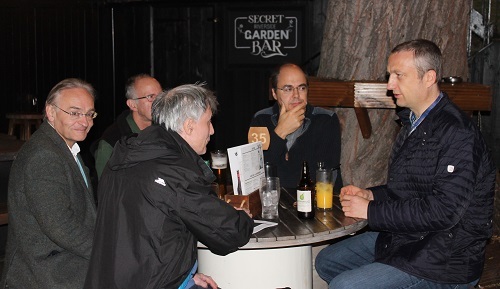 Therefore let me explain again my main critics on that hypothesis by answering your 3 questions (mentioned above) from my codicological and paleographical point of view. 1) Is the Voynich manuscript text encryted? No, not as a whole. More than a dozen glyphs in the VM are well known to be used in other manuscirpts of that time period to, and secret alphabets were known to most professional scribes. It is highly probable that some of these glyphs are mixed in the text and have a secret meaning, but they dont dominate the script and appear rather seldomly. 2) Is the Voynich manuscript text ordinary text written in an unknown script? No, the script is absolutely not unknown. The handwriting in the VM is a combination of usual contemporary and earlier writings in a highly individualized manner and therefore kind of an unique private script. As you wrote yourself: “Writing in a non-standard script is equivalent with a simple encryption process.” That’s right! This personalized script itself is the encryption! 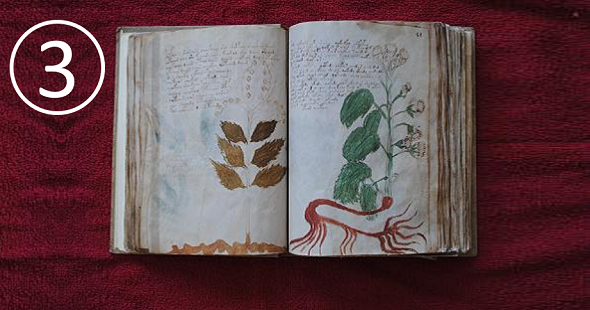 3) Is the Voynich manuscript text nonsense? No. Why should some one spend a fortune to produce nonsense, and why should at least two scribes be occupied with that? Another argument: there are corrections in the text and marginalia in German which would be completely needless if it was nonsense. The VM has a meaning and a purpose. 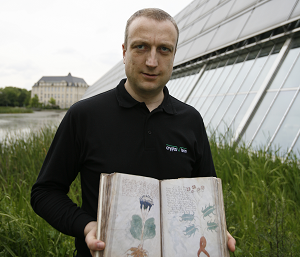 In my view the script of the Voynich manuscript is otherwise unknown. There is simply no other document known to exist that is written in this alphabet. Even if there was such a document (or something written in a similar writing system) this wouldn’t change much from the point of view of a cryptologist. To sell it to a rich book collector. I’m sure there were people in the 15th century who would spend a lot of money for a mysterious book. The collector might or might not have been involved in the fraud. Do you take it for granted that there were two different scribes? I know that there are two (or even more) different styles in the VM writing, but they still might stem from the same person. Even if the VM was written by two persons, what does it say? If I was a rich book collector interested in a forgery, I could easily imagine to hire a whole team of scribes in order to get the book sooner. The Voynich “alphabet” as a whole writing is in fact otherwise unknown, but single graphs (or glyphs) are pretty well documented in a lot of contemporary manuscripts. And yes, I take it for granted that there were two different hands (at least for the main part of the ms) because the difference is clearly visible for any trained paleographer. It would certainly be helpful to disctinguish between cryptology and cryptography. I understand your point from a cryptologist’s view, but the Voynich manuscript can only be “decyphered” by using paleographical methods. The text of the VMS is full of similar words like ‘qokeey’ and ‘qokey’. As more frequently a word is used, as more similar words exists. This makes the VMS special. A text using human language contains many different words. For such a text it makes sense to search for patterns such as similar words or common prefixes and suffixes. The VMS is is full of words similar to each other. By searching for groups of words similar to each other the researcher would find the majority of words in the VMS. The search for linked glyphs reveals that the VMS is full of families of strongly-linked glyphs. The problem is not to find similar words or linked-glyphs, the problem is that too many of them are found. For instance many words start with ‘qo’. Therefore it seems reasonable to assume the existence of a prefix ‘qo’. In fact ‘q’ is followed by ‘o’ in 5291 out of 5425 cases. But ‘qo’ itself is followed by ‘k’ in 3116 out of 5291 cases and ‘qok’ on the other hand is followed by ‘e’ in 1387 out of 3116 cases. With other words there is no prefix ‘qo’ there are only many similar words sharing this sequence of glyphs. With all the features of the VMS in mind my conclusion is that the text of the VMS is a copy of itself. The most simple way to generate text is to copy it. Easier than to copy some text from an external source, is to copy glyph sequences from the lines previously written. Listen very carefully – I shall say this only once! The Voynich manuscript writing is not writing at all, it is a drawing of writing. The author/s wrote groups of c’s across the page then drew a crossbar connecting some of the c’s at the start of groups, then added the gallows characters – he proceeded to add/amend characters before and aft of the groups of c’s finally adding ‘qo’ to the front of any group that still had a large gap between it and the preceding group. As to who and when my inclination is to believe it is a 15/16th century prank by a group of students on a tutor to which Voynich has added a few touches in favour of it being by Bacon. The latter is speculation on my part – the former fact – (whether anyone agrees with it or not). >visible for any trained paleographer. This is interesting to know. I never was sure about this issue, but I’m not an expert on paleography. Hat es einen speziellen Anlass in London was das VM betrift ? Does it have a special occasion in London what the VM? Einen Text mit Schablone lesen ist eine Sache, aber ihn zu schreiben eine andere. Wie soll das gehen ohne Raster oder Markierungen. Er muss die Leerräume ja noch ausfüllen. Ich denke das müsste man bei soviel Text sehen, so ohne PC. Daher schliese ich mich an Nick’s Meinung gleich an. PS: Die Pflanzen sind autentisch und keine Fantasie. Reading a text with template is one thing, but writing it another. How is this to go without raster or marks. He still has to fill the spaces. I think you would have to see with so much text, so without a PC. So I agree with Nick’s opinion. PS: The plants are authentic and not fantasy. I cannot (yet) absolutely disprove that the fifteenth century Voynich Manuscript was hoaxed using a sixteenth century table-and-grille in the way that Gordon Rugg proposes. However, given that his proposed solution requires us to rewrite our history books several times over to make history retrospectively conform to his claim (and then still fails to explain even half of what we see in Voynichese), all I can say is that it looks (and smells) like historically naive nonsense that only an idiot would believe. You don’t seem aware that the McCrone ink tests reveal that the marginalia you refer to was written using the same ink as the main Voynich text. Since inks were mixed in individual batches, this implies that both were written at approximately the same time. Therefore the marginalia, rather than indicating authenticity, implies that it was added to mimic later interest, by different hands at different times, and therefore is evidence of a ruse. I think #4 is most likely, and that it implies that the marginalia was added for effect only, by a forger, to imply the work was genuine, and of interest to later (imaginary) investigators. Or the marginalia where copied alongside with the rest of the manuscript. Ich denke dieses Buch ist ein Destillierbuch mit Rezepten im weitesten Sinne. Zur damaligen Zeit eine weit verbreitete Methode medizinische “Wässer” aus Pflanzen herzustellen. Es galt die Annahme in den 4 Elementen leben Naturgeister, die Gott mit einer Seele ausgestattet habe. Im Wasser zum Beispiel die Undinen, in der Luft die Sylphen. Es wäre gut nachvollziehbar, die Abbildungen mit den nackten Frauen zeigen Naturgeister, die sich während des Destillationsprozesses in den Kanälen und Bottichen/Gefässen solch eines Apparates bewegen. Die Ernte der benötigten Pflanzen könnte (wie auch in mancher moderner Literatur heute noch empfohlen) sich an astrologische Vorgaben orientieren- nur zu bestimmten Zeitpunkten und eventuell auch nur an bestimmten Orten gepflückt- können die Pflanzen ihre volle Wirkung entfalten. John Dee und Edward Kelley – dieses Magiergespann, entwickelten bereits Geheimschriften (enochische Engelschrift etc), ich könnte mir vorstellen, dass aus Geldnot ein Projekt entstanden ist, das sich durchaus auf ein Original stützt, das von den Arabern überliefert wurde. Im Austüfteln von Geheimschriften versiert, könnten sie arabische Schriftzeichen mit eigenen Glyphen ergänzt/abgeändert haben, dass es einerseits durch die Abbildungen vertraut wirkte, andererseits diesen Hauch eines besonders geheimnisvollen Rezeptbuches vermittelt, dessen Entschlüsselung womöglich lebensverlängernde Elixiere etc versprach, die von solcher Bedeutung sind, dass sie natürlich nur verschlüsselt weiter gegeben werden könnten. Und natürlich dementsprechend den Preis hochtreiben. Bis in unsere Zeit :-). Das ist so ein erstes Bauchgefühl bei dieser Sache. Natürlich könnte es auch ganz anders sein. Was mir noch dazu einfällt- ich bin selbst Blumenmalerin (mit Ölfarben)- diese Pflanzenzeichnungen sind sehr nachlässig und schlampig gemalt – ein Kind mit wenig Begabung könnte besser zeichnen. Es sieht aus, als ob jemand unter Zeitdruck mal schnell von einer Vorlage abkopiert und hingeschmiert hat. Und dabei Details weggelassen bzw. abstrahiert hat. Auch die Positionierung der Pflanzen auf den Seiten sehen etwas willkürlich gewählt aus, nicht wirkliche Mühe dafür gegeben. Wies halt mal gerade Platz gefunden hat. Und dann den Text mehr oder weniger gut um die Pflanze herum drapiert wurde. Bei der Farbauswahl denke ich, versuchte man bei manchen die Pflanzenteile dahingehend farblich darzustellen, wie sie anschliessend alchemistisch laut Spagyrik verarbeitet werden können. Wenn jemand wirklich mit dem Herzen bei der Sache gewesen wäre, hätte er sich wesentlich mehr Mühe gegeben. (Siehe andere Kräuterbücher zu der Zeit) Diese ja fast lieblose Gestaltung des Buches/Manuskriptes zeigt für mich persönlich, dass es dem Autor oder den Autoren nicht um die Sache selbst ging, sondern mit geringstmöglichem Zeitaufwand etwas möglichst Glaubwürdiges zu produzieren, ich glaube auch hie und da etwas versteckten Schalk heraus zu spüren. Vielleicht glaubte man auch nicht wirklich daran, dass man Erfolg mit einer kostspieligen Veräußerung haben könnte und hat es sozusagen versuchsweise als ein Experiment losgelassen. Aber wie man heute sehen kann erfolgreich. Ich bin heute zufällig über das Voynich-Manuskript “gestolpert” und bin durch den Wikipedia-Artikel auf diesen Blog-Beitrag gelangt. Nachdem ich den Text-Auschnitt im Wikipedia-Artikel in Gedanken nachgezeichnet hatte, erschien es mir sehr eindeutig, dass der “Text” unter rein ästhetischen Gesichtspunkten geschrieben wurde. Ich hätte den “Text” genau so geschrieben. Als Kind in der DDR hatte ich hin und wieder geliehene Schallplatten “aus dem Westen” zum Kopieren auf Tonband bzw. Kassette zu Hause. Da ich die Schallplatte wieder hergeben musste und es keine Kopiergeräte gab, habe ich mir die Mühe gemacht, sie sehr akribisch abzuzeichnen und abzuschreiben. Ich könnte mir sehr gut vorstellen, dass der Autor ebenfalls “solch ein Buch” besitzen wollte und es sich einfach selbst gemalt hat. Meine Frau hatte dazu den guten Gedanken, dass das Manuskript gut zu einer, offenbar reichen, Teen-Agerin passen würde, wenn man sich die Zeichnungen ansieht. Auch schwangere Frauen dürften im Interesse eines Mädchens in diesem Alter sein. Ich kenne mich nicht in der Nord-italienischen Geschichte des 15. und 16. Jahrhunderts aus, aber vielleicht hatten in dieser Zeit selbst reiche Mädchen es schwer Bildung zu bekommen, so dass sie eventuell gar nicht lesen und schreiben konnte und deshalb diese Schrift erfunden hat. Ich möchte Sie ja nicht gleich desillusionieren, wo Sie doch erst seit heute Kenntnis von dem Manuskript haben, aber Ihre spontanen Überlegungen halten einer näheren Betrachtung nicht stand. Die Vorstellung, dass sich jemand zu Beginn des 15. Jhd. einfach mal selber “solch ein Buch” geschrieben und gemalt haben könnte, ist, mit Verlaub gesagt, mehr als naiv. Womöglich ist Ihnen nicht bekannt, welchen immensen Aufwand an Zeit, Geld und Fachkenntnis es erforderte, einen solchen Codex überhaupt herzustellen. Die jungen Damen des Adels und der Patrizier-Familien waren in aller Regel schon seit ihrer Kindheit überaus gebildet, meist mehrsprachig, und lernten sehr früh, sich in den schönen Künsten zu üben. Bildung war nicht nur ein hohes Gut, sondern vor allem eine nachhaltige Kapital-Investition, wenn es darum ging, den Nachwuchs profitabel zu verheiraten. Die Töchter der Armen, die wie ihre Eltern weder Lesen noch Schreiben konnten, konnten sich selbstverständlich keine eigenen Bücher malen. Und um eine Schrift zu erfinden, muss man erst einmal schreiben können.